The attic and crawl spaces are integral part of the home. They have roots of the property’s insulation and wiring structure and provide worthy storage space. But beware! Leaving them ignored and unattended will not just take away these benefits but also leave your property in shambles. Proper maintenance and regular inspection of the attic and crawl space is crucial for stemming the prevailing dangers. These steps also ensure that the property remains clean, hygienic and energy efficient for years at length. Did you know that the dingy and dreary attic and crawl can also be improvised into usable living area? Look no further! Quartz Solutions is the answer to all such needs. Equipped with high-tech technologies and skilled work force, we provide best and customized solutions for all attic and crawl space needs. Adopting a vigilant and cautious approach towards your attic and crawl spaces will surely pay you big time. Controlling the dangers prevailing in these areas not just enhance efficiency but also help you save huge bucks. 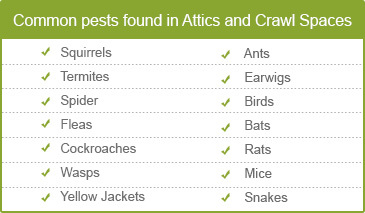 Animals like squirrels, rats, bats and mice scamper in the attic and crawl damaging wires, ducts and cables. They also nibble upon upholstery and furnishings and leave a filthy mess that is infectious. Dripping ducts let water and moisture to seep in. The damp conditions are perfect for mold, mildew and fungus to breed and multiply. They damage wood and structure foundations. Broken ducts impair the property’s heating, cooling and ventilation system. The damage leads to spike in the utility bills. Insects like fleas, cockroaches and wasps pose serious health risk. Termites, white ants and pests eat into the wood and panels and damage structural integrity. Cracked vents allow harmful gases to flow into the crawl space spurring serious breathing troubles and cancer. A careful and cautious evaluation of the attic and crawl spaces is vital to enhance the strength and condition of the property. We, at Quartz Solutions, have a team of certified experts who can handle any issue related to the area. We will drop in to inspect your premises at the scheduled time and meticulously examine the entire area for all existing and impending troubles. Having evaluated the situation, we will formulate a remediation plan that will be custom made for the situation. We understand the value of hard-earned money. Therefore, we strive to provide solutions that will best fit the situation and pocket in every way. Rockleigh is a small borough in Bergen County, NJ. Home to merely 500 people, Rockleigh is ranked amongst America’s most expensive ZIP codes. The serene and quiet ambiance is evident from the fact that large single-family homes are built on large plots of land. With greenery all around, the charm and charisma of the space is indescribable. We, at Quartz Solutions, want to be part of the immense beauty. 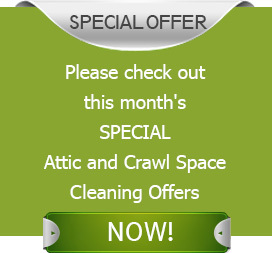 Hire us to help you keep your attic and crawl spaces in top notch condition. Call Quartz Solutions at 201-205-2042 and schedule your free inspection, now! Simply outstanding! Had hired them the previous night. The installers with their specialized equipment were at my doorstep the next morning on time. They removed the damaged insulation and worked on the damaged areas before installing the new one. Neat clean work, superior workmanship! Work completed to my satisfaction. Professional people. Effective results. Good value for money! Thanks Quartz Solutions.